It is normal for a snorer to wonder what sleep apnea is and if they are at risk. Apnea simply means “no breathing”. Sleep apnea is a serious condition where your airway repeatedly closes during sleep, depriving you of oxygen until you gasp awake. Snoring, especially loud snoring, puts you at risk of developing sleep apnea later on – as good a reason as any to address your snoring now. Sleep apnea comes in two forms; the obstructive condition is linked to snoring as there is an airway blockage. The other type, central sleep apnea, is due to a fault in the brain’s regulation of breathing – this type is not linked to snoring. 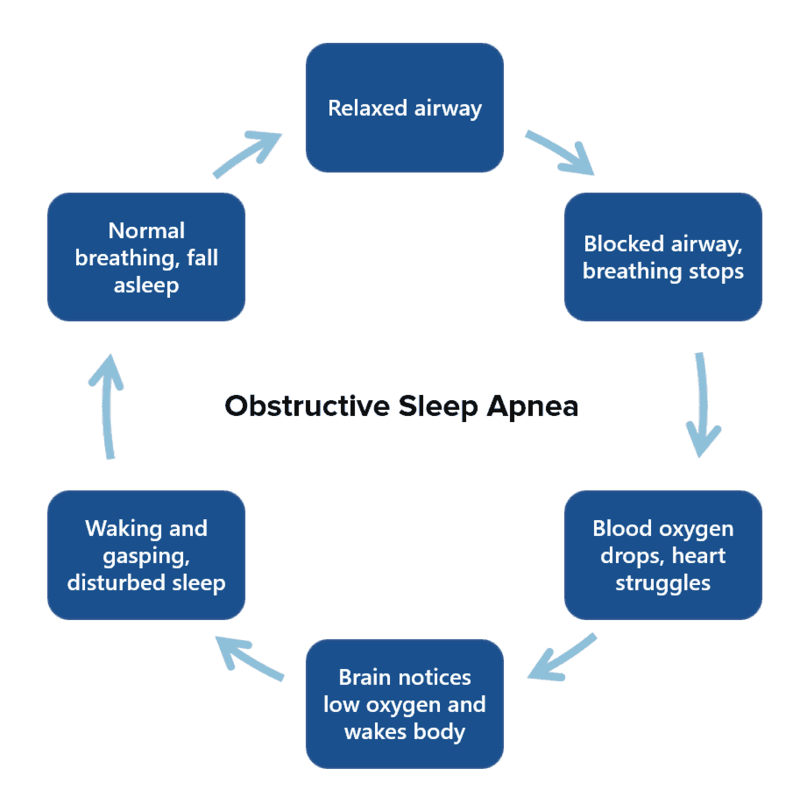 All subsequent references to sleep apnea refer to the obstructive form. How does sleep apnea differ from normal snoring? The key difference between snoring and sleep apnea is whether or not you are breathing. When you produce a snoring sound, you are breathing; air must be travelling through your airways and into your lungs, albeit a bit bumpily. Noise from snoring is bothersome but the more worrying event is when the sound suddenly stops – now you aren’t breathing. 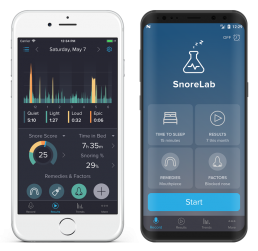 Here, snoring has made the serious transition to obstructive sleep apnea. Thankfully your body has a mechanism to kick-start breathing again. When it stops for too long, the amount of oxygen in the blood drops and carbon dioxide rises; your brain recognizes this dangerous situation. A fizz of brain activity briefly wakes your body up, often with a gasp or snort. Muscles in your neck open the airways so air can get back into the lungs. Sadly, when you go back to sleep, this process of obstruction, low oxygen and awakening repeats itself again and again. Beyond the sufferer, sleep apnea impacts upon society too. At work, persistent tiredness shrinks productivity and means more days taken off sick . On the road, studies have found that people with sleep apnea are twelve times more likely to be involved in road traffic accidents. Some countries now make it mandatory to inform the driver registration authorities if you are diagnosed with sleep apnea . What can put you at risk of sleep apnea? Despite continuously waking during the night, sufferers don’t usually realize it themselves. Many people assume that the fatigue they are experiencing is a symptom of age so fail to seek help. Instead, partners of those with the condition are more likely to spot their sleep apnea. How does sleep apnea severity vary? Your score is very important when deciding on the best way to treat your sleep apnea. Mild to moderate cases can be addressed with normal snoring reduction techniques and consumer remedies. If you have a severe case, continuous positive airway pressure devices (CPAP) are the most effective form of treatment. It is important to know that relatively benign snoring can make a dangerous transition to obstructive sleep apnea. This is a serious condition where your airway repeatedly closes during sleep, briefly depriving you of oxygen until you gasp awake. Low oxygen events and continuous poor sleep can have serious repercussions on both your physical and mental wellbeing. The same things that cause snoring put you at risk of sleep apnea. Some people even consider loud snoring to be the first stage of “sub-clinical” sleep apnea. Importantly, up to 95% of people with sleep apnea snore , but not everyone who snores has the condition. Understand your risk and know how to spot the signs so you don’t make the switch.